Little late on doing my monthly updates. A lot of things have actually happened. I recently got cast in a Fox pilot, which is great because it was initially a really light pilot season. In fact, I was actually supposedly booked in a much smaller role in the show but then they cut from the script. A week later, I got notice that they had written in some new roles and because they had already seen me they just gave it to me. It was a really great experience, but with the looming writer's strike it may not actually even happen so we'll see what happens. I'll write more about it when I figure out if that gets settled. So Hand Fart played at the Nashville Film Festival, which I thought was great because it's the first non Asian related festival we got into. Me and Travis both flew down there and it was our first time going to Nashville. There's some really great red carpet photos we were able to take. Our first screening unfortunately played at a bad time because it conflicted with the opening party and the local shorts program. It was less than half full, but it played really well. We both had to leave before our second screening, but apparently it was almost full during that one. I knew we probably wouldn't win any of the traditional jury awards, but I got notification that we actually won the audience award. We're even featured in an article in Variety, which is my first time being in that publication. http://variety.com/2017/film/news/nashville-film-festival-complete-winners-list-1202403863/ I have my certificate coming in the mail and in the meantime, I get these cool laurels now. I hadn't won an award for my movies since we won the audience award for Steve Chong so I'm glad that I feel like I'm getting back into the groove of becoming an award winning filmmaker again. I otherwise have a short that is playing at the LA Asian Pacific Film Festival again this upcoming week. It's from a script that I didn't write, but I was asked to direct from a friend. So I don't feel like it is a movie that is exactly mine, but I'm still glad I have a movie in the festival again. 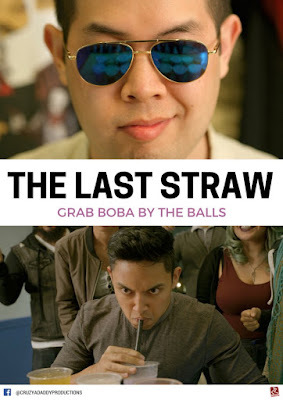 It's called The Last Straw and is about competitive boba drinking. Other than that I've been very much inspired to create a lot more. I'm writing a zombie feature with an old collaborator and still polishing a previous pilot from before. I'm really trying to get a 10-15 minute short off the ground in the next few months. The year is starting off pretty strong. I'm looking forward to it.